We have "the answer to your dreams" with two spectacular Scottish Highland Farmhouses, available to rent. 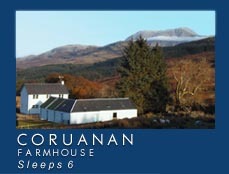 Coruanan Farmhouse sleeps 6 and has a view directly onto Ben Nevis and the surrounding hills and loch. 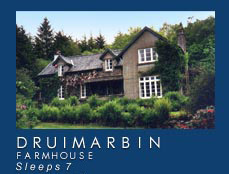 Druimarbin Farmhouse sleeps 7 and faces due west over Loch Linnhe. Both are situated in totally private and tranquil locations on a private estate, a mile apart from each other and have three/four star awards from the Highlands of Scotland Tourist Board. Although quite remote they are only three miles from Fort William. Whether you want to explore the great outdoors, tour the Western Isles, walk, climb or ski, what could be better than to escape from the pressures of life and unwind beside an open log fire in the midst of such wonderful scenery.